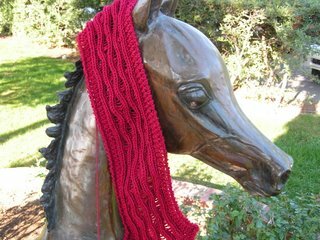 Just so you don't think I spend all my days working on ballband bags - here is another scarf I am knitting for the Red Scarf Project 2007. I love the stitch pattern - it's sort of a wavy dropped stitch that I found in a stitch a day calendar. I may have a hard time parting with this one! More ballband bags soon, don' t worry. 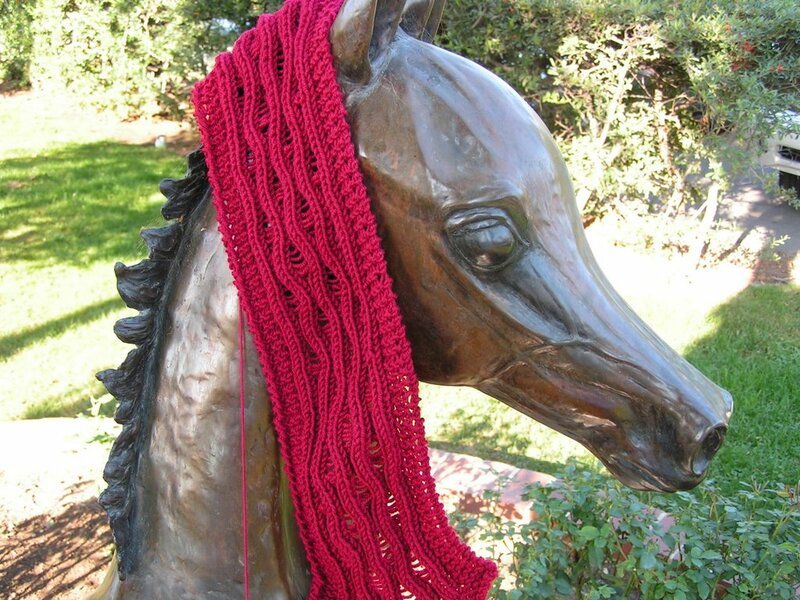 Scarf turned out wonderful!!.. Dontcha love that ballband bag.. I'm just finishing mine up and getting ready to felt I am excited to see how it turns out. Love the scarf. What a fun pattern. It's nice to have a few things you're working on at the same time. Can't wait to see more ballband bags tho... love your color combos!! Pretty! Love the horse, too. That stitch is so great on a scarf! Love it. Is this you... Alison who is Jay and Nancy's friend? This is Carrie writing... Jay's little sis. I just stumbled across your site because I just finished that Mitred square bag. I'm going to use it as a teaching patter. I used Cascade "Jewell" which is a little thicker than 220. How did you stitch the bag sides to the band? Looks like you did a great job! I've got to run, but if you are who I think you are (I'm guessing from the profile) drop me a line! I haven't updated my blog in ages, mainly because I'm working on Christmas presents and don't want to spoil surprises! The scarf looks beautiful. Make 2 one for you and one to gift. Reply to Carrie - don't know if you'll read this for the answer to your question - i can't find an e-mail address on your blog but yes it's me! E-mail me at lahamlt @ gmail . com and I'd be happy to discuss the mitred square bag. Too funny to "meet" like this!